Spherical Plain Bearing GE.ZO Series belongs to the technical field of rolling bearings, and specifically relates to a spherical joint bearing used for swinging, tilting and rotating motion. The left and right hemispherical outer rings are symmetrically arranged on the spherical surface of the rolling body, and the oil passage holes are arranged in the rolling body to communicate with the inner spherical surfaces of the left and right hemispherical outer rings, and have the characteristics of simple structure, less wear and long service life. Through comprehensive analysis, it is found that the maximum speed of the Spherical Plain Bearing GE.ZO Series is related to many factors, including product type, size, accuracy, load, lubrication degree, etc., and the most influential is the lubrication and the working temperature that can be withstood. . 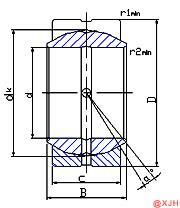 When the bearing is operated under a certain load condition, the contact stress between the rolling element and the contact surface of the raceway will increase, so that the working temperature of the bearing will also increase, so that the lubrication effect will be affected, and finally The consequence is that the limit speed of the bearing has decreased.